The Biology Graduate Program established three years ago at UBC's Okanagan campus is already earning a reputation for student excellence. About a third of the 15 master's degree and six PhD students currently enrolled in the Biology Graduate Program are recipients of major external fellowships, such as the highly competitive Natural Sciences and Engineering Research Council (NSERC) fellowship and Pacific Leaders Scholarship. 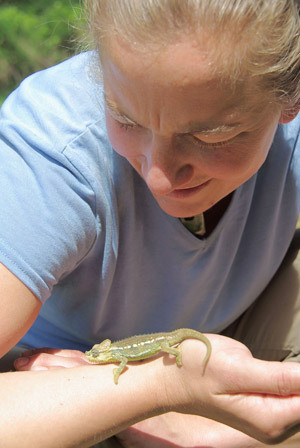 Biology graduate student Natalie Melaschenko travelled to Kenya in 2009 to study field techniques at the Mpala Research Centre. "To have such a high percentage of our graduate students receiving these prestigious and competitive fellowships is huge," says Karen Hodges, Biology Graduate Program coordinator. "It really points to the quality and relevance of the work being done by our students, as well as the depth of our program, which is able to offer students solid, meaningful projects with international relevance in a competitive, supportive environment." Research conducted by the biology graduate students covers a diverse range of inquiry -- such as building a better understanding of the ecology of bobcats, looking at how to restore degraded wetlands, and studying the structure of endangered plant communities in the Okanagan. Three graduate students have obtained International Education Travel Subsidy funds from the Irving K. Barber School of Arts and Sciences to support aspects of their research. Natalie Melaschenko travelled to Kenya to study field techniques at the Mpala Research Centre. Haley Catton will be traveling to Australia, and Chandra Moffat will be conducting fieldwork in Switzerland this summer. In addition, a number of biology graduate students will present their research to leading experts at international conferences this year. "Students are not just being trained to develop expertise, but to share their expertise," says Hodges, noting that the program encourages partnerships between undergraduate researchers and graduates to further enhance the learning environment. "We want our students to connect to society in broader ways. They work on real problems that have been identified as issues by society. They are confronting humanity's questions," says Hodges. Roughly half of the graduate students in the biology program are tackling research projects with linkages to a variety of government agencies including Environment Canada, the B.C. Ministry of Forests, and Agriculture Canada. "Our program allows students to grow their intellect while tackling something that matters," says Hodges. "It is so deeply exciting for faculty and students alike to work together on things that are fundamentally unknown. That's really our job: to be on the edge of knowledge." A number of the students have come from outside the UBC system, including four international students, which reflects the notable reputations of the faculty members who are conducting relevant and exciting research, says John Klironomos, a professor of biology who is involved with the graduate program. "Most graduate students choose a university because they are excited about the research being done by an established, well-known researcher," says Klironomos. "You attract the best and brightest by offering exciting, relevant, cutting-edge research initiatives that are meaningful, and that's what our faculty is able to do."